Some hikers like to disconnect from the internet completely when they’re outdoors. Others like to utilize the web, technology and a hiking app to enhance their hiking experience. There are tons of apps out there today that are for hiking, outdoor fitness, backpacking, etc. And, everyday, it seems like companies are coming out with more apps to help you make the most of your experience on the trail. Apple just released the ViewRanger App, now available for the Apple Watch. It’s the first hiking app ever to use GPS on a smartwatch. Of course, if you don’t have an Apple Watch, it’s also available on other devices, including Android. And, this season is the perfect time to break it in. A Hiking App Made for the Trail? ViewRanger is an app that lets you download route guides, worldwide maps, and uses a strong GPS navigation for any map you select. There are thousands of maps available to choose from, and the app offers local suggestions as soon as you sign in. There’s a lot of reasons this app is great for hikers, one of course being that you can wear it on a watch. But, the other is that it works even when you don’t have a cell phone signal; something hikers are faced with often. Just make sure you save the maps you want to use before you leave your home, this way you can pull them up later. While there are many mapping apps out there for hikers, ViewRanger was started when the founders became “frustrated with the limitations of consumer GPS and mapping tools.” ViewRanger is the first app of its kind to create panoramic mapping, among a few other noteworthy achievements, like being the first GPS hiking app to be able to run on an Apple Watch. This means you can easily use the app while you backpack. Each one of the hiking maps posted on ViewRanger are created by experts, including topographers, travel writers, national parks, and ViewRanger’s very own community. Of course, you can also share your own favorite routes, as can other avid hikers. The ViewRanger hiking app may be based in the UK, but it’s available to use anywhere in the world. So, if you’re hiking near your home in North America or you’re off on a hiking excursion in Central Asia, the app functions anywhere. If you’re concerned about how reliable ViewRanger is, don’t be. This app has been used by search and rescue teams in the U.S., Canada, and Europe. By using this app, they are able to locate injured or lost hikers and bring them to safety. This hiking app lets you record all your treks, so you can see how far you went or how fast you completed it. When you’re done, if you’re happy with your results, you can easily share to any number of social media networks. If you’re wondering what ViewRanger reminds you of, then there are a few similar hiking apps. These include Map My Hike, Runtastic Mountain, and Komoot. Just remember that this is the first app to be functional on an smartwatch. Yes, you heard right. 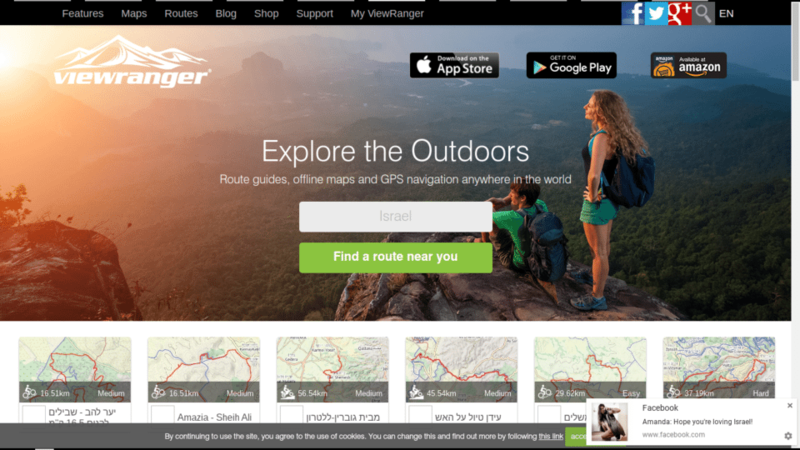 The ViewRanger hiking app won’t cost you anything. There are in-app purchases available, but you won’t need to buy any of those to use this app. Download ViewRanger at the Apple Store or on Google Play.